Home » cash » Food n Beverage » lucky » lucky draw » offline contest » purchase » spend » Peraduan Hari Ulang Tahun Shoon Fatt Jom Menang Contest: Up to RM26,888 worth of cash & prizes to be won! 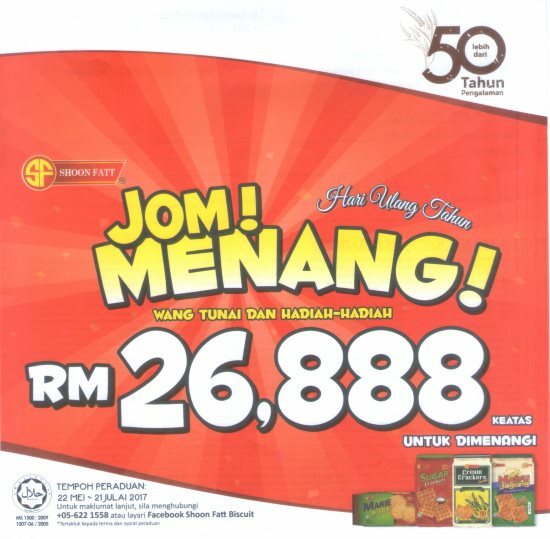 Peraduan Hari Ulang Tahun Shoon Fatt Jom Menang Contest: Up to RM26,888 worth of cash & prizes to be won! Answer correctly 2 of the questions in the Contest Form. Complete your personal details in the Contest Form, attach the codebar OR tax receipt copy and mail it to the address stated in the Contest Form.